I've never actually seen a little train set chugging along beneath a Christmas tree in real life like in movies and cartoons, but it must be a real tradition for some people. The problem I see is that it doesn't leave enough space under the tree for Santa to cram in all the gifts. 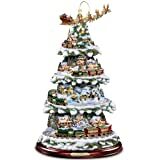 The solution is to take the train set to the next level... the middle of the tree! 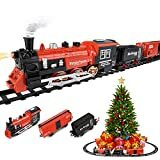 The cool new In-Tree Christmas Train is a fun and festive working train set that encircles the middle of either a fresh or artificial tree by attaching directly to the inner trunk and features an engine, cargo and passenger cars, and a caboose all decorated up for the holidays. The only downside to a super cool train choo-chooing around the middle of the Christmas tree ... curious attack cats who want to derail the holiday cheer. Makes authentic steam-whistle sounds and the engineer bellows "All aboard!"